"The correct botanical names of most West Australian orchids are euphonious, and not too difficult for even children to learn. Once the meanings are understood and the described characteristics have been observed in the growing plants, the terrors of the names vanish, and their usage becomes a matter of course. Classification of West Australian orchids, so far as genus is concerned, is not usually difficult. With the aid of this book (or website) it should not be beyond the power of any person or child of reasonable age, sufficiently interested, to learn to run out both genus and species of any West Australian orchid for themselves." 'Yerina Springs' Yerina Springs Spider Orchid c wispy 08 aug two + paired - two longitudinal rows of paired calli. Caladenia brownii Karri Spider Orchid club sep 10 oct Andrew Brown (1951-), orchidologist, orchid expert and author. bry-see-ah-nah Dwarf Spider Orchid crested 08 aug Francis Bryce Maclntyre, orig.col., found near Gnowangerup in 1914. Caladenia busselliana Bussell's Spider Orchid club sep 09 sep Greg Bussel, orig.col., 1990, helpful orchid enthusiast. Caladenia cairnsiana Zebra Orchid crested 08 aug Honouring the Rev. Adam Cairns, of Melbourne. Caladenia chapmanii Chapman's Spider Orchid c wispy 09 sep Eric Chapman of Dinninup, keen WA orchid enthusiast. Caladenia christineae Christine's Spider Orchid c white 10 oct Christine Hopper - wife of Prof. Steve Hopper. Caladenia dorrienii Cossack Spider Orchid c wispy 10 oct Capt. Arthur Algernon Dorrien-Smith, orig.col., (1876-1955), English naturalist. Caladenia doutchiae Purple-veined Spider Orchid crested 09 sep Leila Beatrice Doutch, orig.col., 1921. Caladenia drummondii Winter Spider Orchid c white 05 may James Drummond, orig.col., (1784-1863), Botanist, naturalist and avid collector. dun-das-ee-ay Patricia's Spider Orchid c wispy 08 aug Patricia Dundas (1952-), botanical artist and orchid enthusiast. heb-er-lee-AH-na Heberle's Spider Orchid c white 09 sep Ronald Heberle, (1913-2004), orchid expert, photographer and self taught naturalist. Caladenia hoffmanii Hoffman's Spider Orchid club tep 08 aug Noel Hoffman, orchid photographer, enthusiast and author. 'Quindanning' Quindanning Spider Orchid c white 10 oct Professor Stephen Donald Hopper (1951–), discovered and named many WA orchid species. Caladenia huegelii Grand Spider Orchid club sep 09 sep Baron Carl Alexander von Huegel, orig.col., (1794-1870), Austrian botanist. Visited the Swan River colony, WA. 1833. 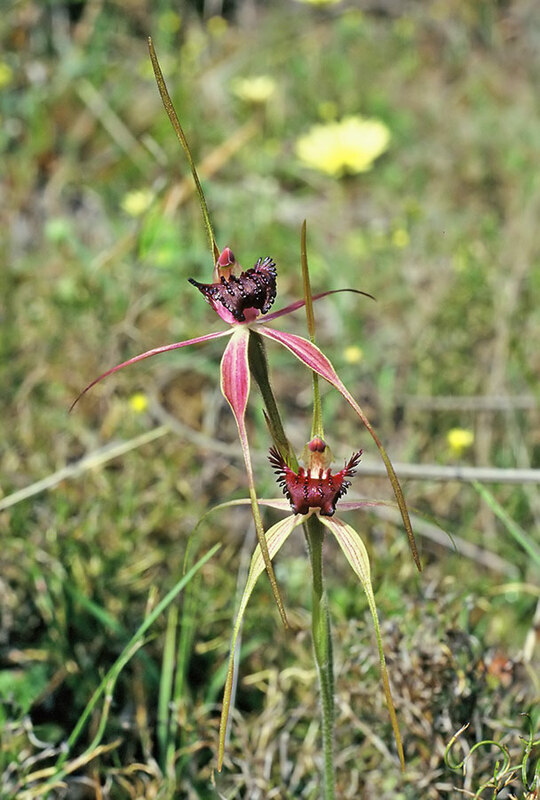 Caladenia longicauda ssp. merrittii Merritt's White Spider Orchid c white 09 sep merretii: Wayne Merritt, orig.col., orchid enthusiast. Caladenia pendens ssp. talbotii Talbot's Spider Orchid c wispy 09 sep Len Talbot, orig.col., Forester. 'Yuna' Yuna Spider Orchid c wispy 08 aug relating to rain - flowers profusely after good winter rainfall. ROW-eye Clown Orchid crested 08 aug John Septimus Roe (1797-1878), Surveyor, Explorer and Botanical Collector. Caladenia startiorum Start's Spider Orchid c white 09 sep Joff Start and Family, orchid enthusiasts. 'Island Point' Island Point Spider Orchid c white 10 oct Eric Swarts (1954–) and son Nigel Swarts (1981–), orig.cols. 'Muir Highway' Lake Muir Spider Orchid c wispy 09 sep strong, robust + nerved - the often prominent dull red stripes on the petals and sepals. VOY-tee-eye Mohawk Spider Orchid crested 09 sep Don Voight, orig.col., Esperance orchid enthusiast. Caladenia williamsiae William's Spider Orchid club tep 08 aug Judy Williams, orig.col., found on a single reserve near Brookton - 450 plants on 2 ha. Caladenia winfieldii Majestic Spider Orchid c white 11 nov Harry Winfield, orig.col., Forester. Discovered in 1987 near Walpole. Less than 100 known. Cyanicula amplexans Dainty Blue Orchid 08 aug encircling, clasping - labellum embraces the column. Cyanicula ashbyae Powder-blue China Orchid 10 oct Alison Marjorie Ashby, orig.col., (1901-1987), botanical painter. Cyanicula gertrudiae Pale China Orchid 10 oct Gertrude Ostenfeld, daughter of orig.col., Carl Ostenfeld. Cyanicula nikulinskyae Esperance China Orchid 09 sep Philipa Nikulinsky (1942-), botanical illustrator and artist. Cyrtostylis huegelii Midge Orchid 07 jul Baron Carl Alexander von Huegel, orig.col., (1794-1870), naturalist. Visited the Swan River Colony (Perth) in 1833. Diuris corymbosa Common Donkey Orchid donkey 09 sep cluster - flower arrangement. Diuris drummondii Tall Donkey Orchid d bee 12 dec James Drummond, orig.col., (1784-1863), naturalist and avid collector. Over 100 plant species have been named in his honour. sp. ‘eastern wheatbelt’ Yellow Granite Donkey Orchid donkey 08 aug Hazel King, plant collector, conservationist and orchid enthusiast. Diuris heberlei Heberle's Donkey Orchid d bee 12 dec Ron Heberle, (1913-2004), orchid expert, photographer and self taught naturalist. sp. ‘Dunsborough' Dunsborough Donkey Orchid donkey 09 sep David Jones, botanist and Australia's orchid guru. Diuris purdiei Purdie's Donkey Orchid d nanny 10 oct Alexander Purdie, orig.col., (1859-1905). Enthusiastic collector of WA flora. sp. ‘Eneabba’ Arrowsmith Pansy Orchid donkey 08 aug Allan Tinker. Legend from the Western Flora Caravan Park. Drakaea andrewsiae Lost Hammer Orchid 09 sep Mrs Andrews, orig.col., 1930. Leptoceras menziesii Rabbit Orchid 09 sep Dr. Archibald Menzies, orig.col., (1754-1842), botanist and early WA plant collector. Microtis brownii Sweet Mignonette Orchid 12 dec Robert Brown, orig.col., (1773-1858), naturalist. Paracaleana alcockii Alcock's Duck Orchid 09 sep Prof. John Alcock (USA) - behavioral ecologist and author, who recognised the species as distinct. Paracaleana brockmanii Brockman's Duck Orchid 11 nov Gary Brockman, orig.col., orchid enthusiast and author. Paracaleana dixonii Sandplain Duck Orchid 11 nov Dr. Kingsley Dixon, Director of Science at Kings Park & Botanic Garden and author. Paracaleana granitica Granite Duck Orchid 11 nov found in 'granite country'. Paracaleana hortiorum Hort's Duck Orchid 09 sep Fred and Jean Hort, orig.cols., citizen scientists, volunteers and enthusiasts. Paracaleana lyonsii Midget Duck Orchid 10 oct Michael Lyons, orig.col., 1994, research scientist. Praecoxanthus aphyllus Leafless Orchid 04 apr without + leaf - It does have a leaf, but not when flowering. Prasophyllum brownii Christmas Leek Orchid 12 dec Robert Brown, orig.col., (1773-1858), botanist and naturalist. Prasophyllum drummondii Swamp Leek Orchid 10 oct James Drummond, orig.col., (1784-1863), Botanist, naturalist and avid collector. Prasophyllum paulineae Pauline's Laughing Leek Orchid 10 oct Pauline Heberle, orchid enthusiast. Prasophyllum sargentii Frilled Leek Orchid 09 sep Oswald Hewlett Sargent (1880-1952), Orchidologist. Pterostylis frenchii Tuart Rufous Greenhood p sep down 11 nov Chris French, orig.col. WA orchid expert and author. Pterostylis hamiltonii Red-veined Shell Orchid p sep up 06 jun Alexander Greenlaw Hamilton (1852-1941), naturalist and orchid collector. sp. ‘granite’ Southwest Granite Snail Orchid p sep up 09 sep Bill Jackson, orhchid enthusiast and collector. sp. ‘miniature’ Eastern Granite Snail Orchid p sep up 08 aug Don Voight, orig.col., Esperance orchid enthusiast. Pyrorchis forrestii Pink Fire Orchid * 11 nov Sir John Forrest (1847-1918), orig.col., explorer, 1st Premier of WA. 1890. Rhizanthella gardneri Underground Orchid 05 may Charles Austin Gardner (1896-1970), Government Botanist WA. Rhizanthella johnstonii Southern Underground Orchid 06 jun Lionel Johnston - helped resolve the distributional status of this new taxon. Thelymitra frenchii Scarp Sun Orchid t blue 10 oct Chris French, WA orchid expert, author. Recognised the species as distinct. Thelymitra jacksonii Jackson's Sun Orchid t star 12 dec Bill Jackson, orig.col., 1988, orchid enthusiast, amatuer naturalist. Thelymitra sargentii Freckled Sun Orchid t yellow 10 oct Oswald Hewlett Sargent (1880-1952), orchid enthusiast. c. 250 species photographed. Easy navigation. 4 downloadable PDF's - 25,000 entries.